The Antivenom Dosing Algorithm specifies the manifestations of Crotalinae (pit viper, formerly known as Crotalidae) snake envenomation that necessitate aggressive management. The Antivenom Dosing Algorithm is a unified treatment algorithm that was developed with the goal of quick identification and management of patients who may benefit from treatment with Crotalidae Polyvalent Immune Fab (CroFab®). There is significant variability among patients with snake envenomations, and this algorithm does not represent a standard of care. All cases of suspected or confirmed snake envenomation should be reported to Poison Control (1-800-222-1222). The Antivenom Dosing Algorithm is an anti-venom dosing tool for Crotalinae (pit viper, formerly known as Crotalidae) snake envenomations. Antivenom is an extremely expensive resource that carries a risk of adverse events. Emergency clinicians should be aware of the indications for its use, as well as other steps to take in the management of patients with pit viper bites. 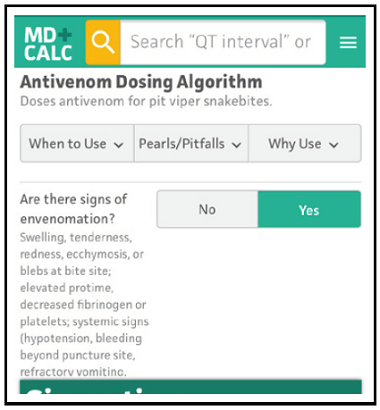 Use the Antivenom Dosing Algorithm for patients with known or suspected Crotalinae envenomation. This algorithm is not valid for snakebites on the head or neck, snakebites causing rhabdomyolysis, or in cases of anaphylaxis/anaphylactoid reactions to venom. This algorithm does not apply to envenomation by coral snakes or any snakes that are not indigenous to the United States. Administer maintenance dosing of 2 vials of antivenom every 6 hours for 3 doses, at 6, 12, and 18 hours after initial control of symptoms is achieved. Maintenance therapy may not be needed if close observation by a physician-expert is available. The patient should return if swelling worsens and is not relieved by elevation; if abnormal bleeding occurs (eg, melena, gum bleeding, easy bruising); or if fever, rash, or muscle or joint pains occur (ie, symptoms suggesting serum sickness). The patient should be given bleeding precautions: no contact sports, elective surgery, or dental work for 2 weeks. The patient should be advised to follow up for repeat laboratory testing twice (at 2-3 days and 5-7 days after discharge), and then as needed. Follow up as needed for cases in which antivenom was not administered or antivenom was administered for copperhead envenomation. The leading edge of swelling and tenderness surrounding the envenomated area should be marked every 15 to 30 minutes. Elevate and immobilize the affected extremity, treat pain aggressively with intravenous opioids, and update the patient’s tetanus status as needed. Lavonas et al analyzed the medical literature regarding use of Crotalidae Polyvalent Immune Fab for pit viper envenomations. After analysis of 42 original articles, this panel of experts met and held a consensus-building meeting, which resulted in a unified treatment algorithm.